At Swim Smooth we're not very interested in counting strokes over single laps. Firstly, your height, arm length and hand size has a huge influence on your stroke length and makes the outright number pretty meaningless. Secondly, it's too easy to fake a low stroke count over short distances. This week on the blog we're going to expand on that second point and discuss the dangers of focusing too much on counting strokes. Every day we meet swimmers who can perform at a low stroke count over single laps but cannot sustain that count for further than 100m. If such a swimmer takes 16 strokes over the first lap, that will soon rise up to 20 or even 25 strokes per lap as they swim longer distances. It's not necessarily a problem swimming with a high number of strokes per lap but this deterioration in stroke count tells us that something is wrong. Try this yourself: swim for 400m as efficiently as you can and count your strokes for the first 25m versus the last few laps. It's normal to lose 2-3 strokes per 25m from the beginning to the end of the 400m but 5+ is suggesting a problem and your stroke may well feel "like it's falling apart" to you. Remember, it's not the outright number we are looking at here but how consistent you can be over the 400m. Conventional wisdom says that a swimmer who cannot sustain their strokes per length should keep practising over short distances with drills and short swims. This is a major mistake because this sort of technique work actually encourages you to develop a stroke which cannot be sustained over longer distances. By overly working the shoulder muscles it's possible to make your stroke longer by actively gliding, however the shoulders are a small weak muscle group compared to those of the chest, back and core and tire very quickly if overused. As the shoulders start to tire your stroke shortens which harms your body rotation, resulting in that feeling of your stroke falling apart. This shortening of the stroke has nothing to do with coordination or control and everything to do with fatigue in this small group. Fatigue in the shoulder muscles is very deceptive - being such a small muscle group they don't elevate your heart rate or breathing very high when they are being overworked. For this reason your perception of effort is highly distorted when trying to make your stroke as long as possible. Sure, it feels easy to swim at a low stroke count for 25 or 50m but this doesn't mean your shoulders won't quickly tire. If you find that you cannot sustain your stroke count over long distance swims then it's very likely that you are overly dependent on your shoulder muscles - which is symptomatic of introducing glide and deadspots to the stroke. To overcome this, work on improving your catch and feel for the water to remove the pauses from your stroke and simultaneously start using the larger muscle groups of the chest and back. You'll know when you start to get this right as you'll be able to sustain your stroke count over much longer distances. We use catch setup, sculling and doggy paddle type drills to help swimmers make this change. All these drills and explanations are in our DVD Boxset but keep an eye out for our new DVD called 'Catch Masterclass' which we'll be releasing very soon. It features all new footage and explanations from our hi-def filming rig, showing you exactly how elite swimmers develop such great propulsion and how to introduce these changes into your own stroke. If you're fortunate enough to be a Smooth Swim Type you may have a problem when swimming in open water. From your pool swimming background you've got the ability to go off fast and lead the race. In traditional pool based races this method always worked well for you and more often than not you led from start to finish. Unfortunately in open water things can be a little different. For a start many of those guys with seemingly ungainly strokes who you can drop in the pool can be really very fast in more choppy open water conditions. These unrefined Swingers have a shorter faster stroke than yourself which helps them punch through the waves and chop from other swimmers at close quarters. Worse still, these guys are often very savvy about the benefits of drafting (up to a 38% energy saving) and have the sort of personality which enjoys the rough and tumble of swimming close to other swimmers. This pack of Swingers will love nothing more than seeing you going off fast and like a group of vultures will jump on your feet and get a free high speed ride (you can almost hear them cackling to themselves). Our advice for Smooths swimming in open water is to learn to play the game: Become familiar with good sighting technique and practise your drafting skills. Sit in the pack and bide your time to unleash your devastating finish when it's needed. Don't be afraid to modify your stroke, experimenting with a higher arm recovery and a slightly shorter punchier style to power through waves and chop. Swimming in open water is great fun and with your skill and technical ability you are more than capable of adapting to this new environment. In time you can learn to dominate it too, just watch out for those bloodsucking Swingers. We're Banning The Word *Slow* At Swim Smooth! Thinking about your swimming in a positive way is so important. The Swim Smooth squads in Perth don't have a slow lane (and that's not because everyone is a world record holder, far from it). Instead we have a fast lane, a faster lane and a fastest lane! This is a small example of the positive psychology you can apply to your swimming. Swimming is a fantastic sport for all offering you health, fitness and friendships. Just learning to swim freestyle is a challenge in itself and everybody feels outside their comfort zone every now and again - that's totally normal. Be determined and overcome these challenges and your self esteem and confidence will get a huge lift. Sure there's always going to be someone faster than yourself but that's no problem - welcome to the water! You may have been told to extend wider to correct a cross-over but we don't like this instruction as whilst it may help correct things in the very short term there's a real tendency to drift ever wider which will reduce your rotation and harm your catch. Instead of thinking wider, think straighter! 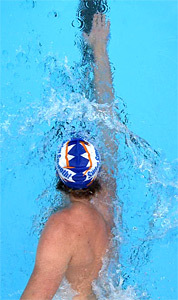 Two thirds of swimmers we work with have some degree of cross-over in their stroke - treat removing yours as a priority.